One Sunday night, walking on Wickham Terrace, we came to a point equidistant between the Church of England [All Saints] and the Presbyterian Church [St Andrews]. Hymns were blaring out of both. My father put his arms around me, begging me with great tenderness to promise him that I would be a poet when I grew up. I gave him my word, and when my first set of verses was printed … I signed them ‘Wickham’ in memory of that curious and very emotional pact. Edith Alice Mary Harper was born in 1884, but as a child she was known as Anne. Her poetry was first published under the pseudonym John Oland, inspired by the Jenolan Caves in New South Wales. In 1915, however, she adopted the pen-name Anna Wickham when publishing The Contemplative Quarry. It is as Anna Wickham that she is remembered and lauded as one of the most noteworthy feminist voices of the modernist era. Over the course of her career Wickham had five volumes of poetry published and also wrote over a thousand unpublished poems. While Wickham was born in England she spent many of her formative years in Australia. She moved to Australia at six and remained until she was 21 with seven of those years spent in Queensland including living in Maryborough and Hughenden. And strength of Charter Towers. I saw by Mary River. In addition to Maryborough and Hughenden the Harper family also spent time in Brisbane. 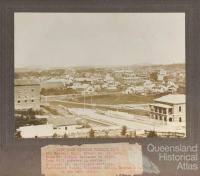 In 1893 Anne and her mother moved to Brisbane to join her father who tuned and repaired pianos. They boarded with the Groom family in their high-set two storey wooden house. Wickham’s biographer, Jennifer Vaughan Jones, noted that while the poet often used pseudonyms in her autobiography, this is less true of the period covering her time in Australia. Nevertheless, there is no record of a boarding house run by a ‘Mrs Groom’ in the post office directories, Pugh’s Almanac or in the newspapers of the time. Wickham describes ‘Daddy Groom’ as ‘stockbroker who had failed’ and Mrs Groom as ‘my first impression of a fine lady’. This suggests that it was a private home and the Groom’s took in the family due to their own strained finances. 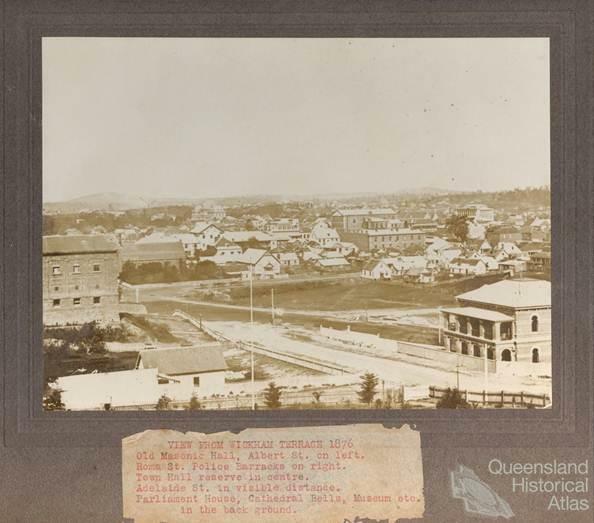 Thomas F. Groom is listed in the Post Office Directory as sharebroker with offices in Queen Street in Brisbane City on the north side of the river. It is likely, however, that their family home was on the south side of the river given the fact they took refuge with the Fenwick family during the flood. 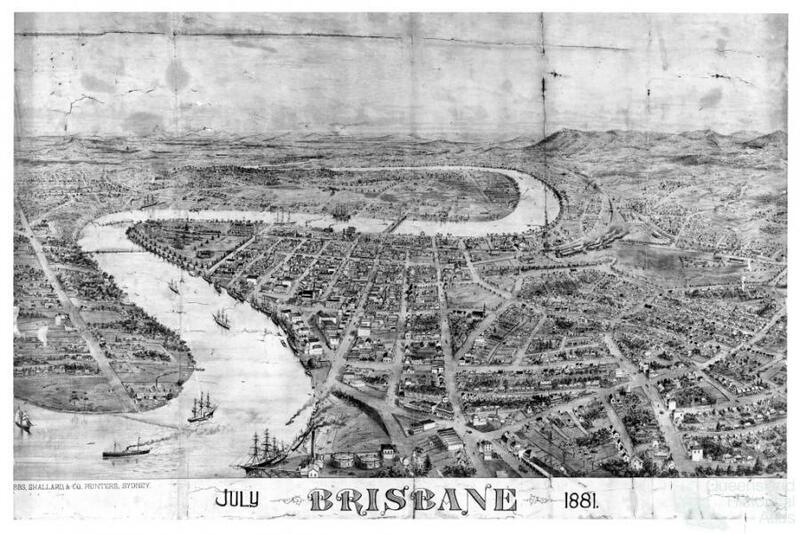 While South Brisbane was predominantly working class it did become home to some of ‘Brisbane’s elite’ who were attracted to the nearness of the city and the availability of land on high ground. Wickham recalled that on the morning of the 1893 inundation, Clement Wragge, ‘a certain wizardly meteorologist’, had moved through the city warning residents. By the afternoon the flood waters had reached the Groom family home and Anne, her mother, and Mrs Groom were taken by boat to the Fenwick’s house. One possible clue to locating the Fenwick house is Wickham’s reference to the family as ‘rich’. John Fenwick was a ‘stock and station agent’ who, like Thomas Groom, had offices in the city. The Post Office Directory lists a John Fenwick as living in Merivale Street near Peel Street. This location also fits with Wickham’s recollections that the house was near a church. St Mary’s Catholic Church was then, and is now, located at the corner of Peel and Merivale Streets. South Brisbane was badly hit by the floods. From the Fenwick’s, nine-year-old Anne watched the river rise. She witnessed the devastation of the area and saw a dead man dragged from the flood waters. 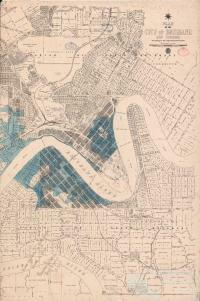 The boxes of wooden houses floated off their piles and into the river where they pounded against the Victoria Bridge. All night she heard the houses hit the bridge. When she woke the next morning Victoria Bridge had washed away. Anne records that next to the Fenwick’s house a large church [St Mary’s] was converted to house flood-victims. Fr. Francis Dorrigan not only opened the church and the presbytery, but also rowed around rescuing those trapped by flood waters. Hope and Grey streets, and indeed the better part of Stanley-street were then green slopes, and St Mary’s Chapel was almost the only building between the south end of Queen-street and Wilson’s Boundary Hotel. Where Edmondstone-street now shows its pretty cottages and villas was heavily timbered forest. My strongest impression of all this ruin and death is the memory of the clock with the chimes, the brass hot-water heater [at the Fenwick’s], and the fact that, as I lay on my extemporised bed on the sofa in the library, I read for the first time Alice in Wonderland. The Groom house, where the Harper family boarded, did not get washed away but much of their furniture was ruined. Three weeks later the Brisbane River flooded again. Soon after her mother gained employment as the assistant mistress at the Woolloongabba School. 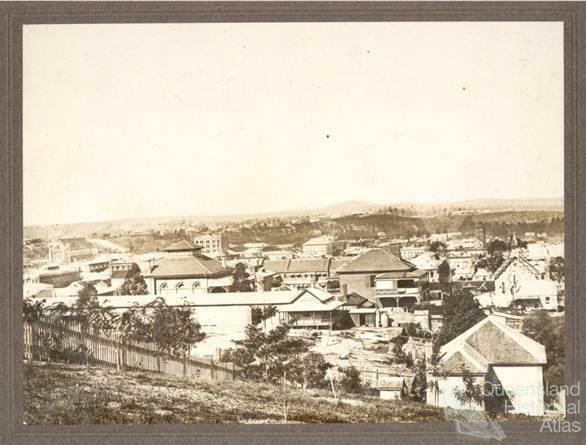 While the influence of her parents, especially her father, was of great importance in determining her future direction, she also received important encouragement from teachers including Miss Story her English teacher at the Brisbane Normal School. She also attended All Hallows’. Anne’s father showed some of her poems to the well-known poet James Brunton Stephens who worked as chief clerk in the Queensland Secretary’s Department. Stephens replied: ‘She will be a poet on a condition you can hardly wish her since you are her father: she will be a poet if she has pain enough’. Wickham proclaimed that she wrote for her father, who both supported and pushed her into a career in the arts. The momentous conversation between the two most likely happened in 1896 while the family was based in Gowrie House on Wickham Terrace. The degree to which Wickham’s Australian experience impacted on her as a poet is contested. She left Australia in 1904 and would never return. She had a remarkable career, active across three decades and writing in a range of poetic styles. Dylan Thomas described her as ‘a large, frenzied poetess’. In the 1920s her home at Hampstead became a literary saloon. She was involved with the establishment of ‘The League for the Protection of the Imagination of Women’ and she maintained her commitment to writing despite significant obstacles, including her husband’s disapproval. Upon the death of her husband in 1929 Australian newspapers labelled Wickham as an ‘Australian writer’ although her Australianness was less prominent in reports of her own suicide in 1947. The Australian literary establishment has claimed Wickham and her work appears in several volumes of Australian verse. 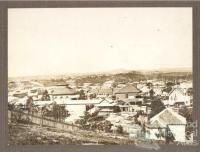 The landscape of Queensland left an impression on Wickham and her time in Australia played at least a small part in shaping the poet and feminist she became.